"If one knows the true meaning of Islam, there will be no wars. and the greetings of peace."
. 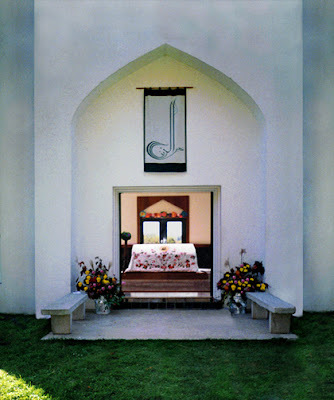 image: The Mazar (Tomb) of Sufi Shaikh Bawa Muhaiyaddeen, may God bless his soul. The mazar is some forty miles from Philadelphia, among the rolling hills and tall trees of Chester County. The Sufi saint passed away in 1986. This beautiful Mazar, the first in the United States, was conceived, designed, and built by the members of the Bawa Muhaiyaddeen Fellowship, and dedicated in 1987. image credit and details.